that due notice by publication of said Order has been given as required by law and said Order. and forty two and 68/100 dollars. further obligation on their bond. Dated the 8th day of December A.D. 1890. 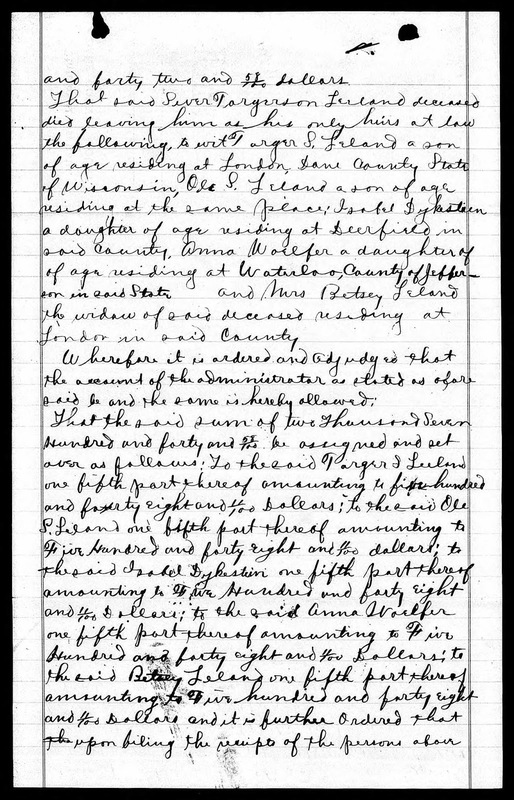 Dane County, Wisconsin, Dane County Probate Records, Box 112-Box 113, Sever Torgeson Leland estate file, Final Judgment, 1890 (images 414-416 of 1293); "Wisconsin, Wills and Probates, 1800-1987," digital images, Ancestry.com (http://www.ancestry.com: accessed 9 September 2015); citing original data in Wisconsin County, District and Probate Courts. 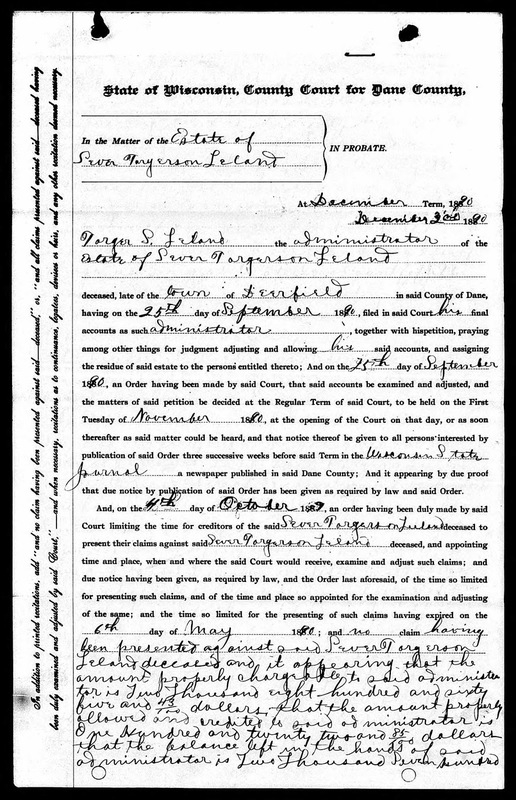 Sever Torgerson Leland (1804-1889) died intestate on 29 March 1889 in Deerfield, Dane County, Wisconsin. His eldest son, Torger S. Leland was appointed administrator of the estate. No real property was included in the estate. Much of the personal property was distributed to the heirs shortly after the death. 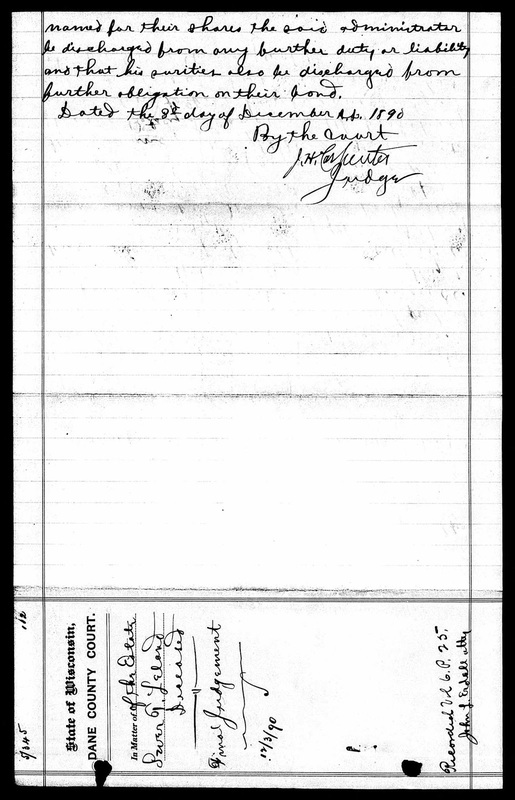 The debts and credits owed to Sever Torgerson Leland and the money in the house comprised the personal property to be distributed. The administrator paid the bills for the monument in the cemetery, the funeral charges, the road tax, the publication charges, and prospective expenses. 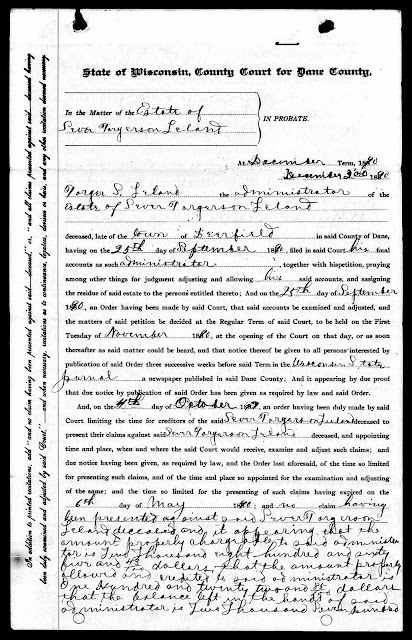 Sever Torgerson Leland is the second great-grandfather of my wife, Linda (Leland) Seaver. 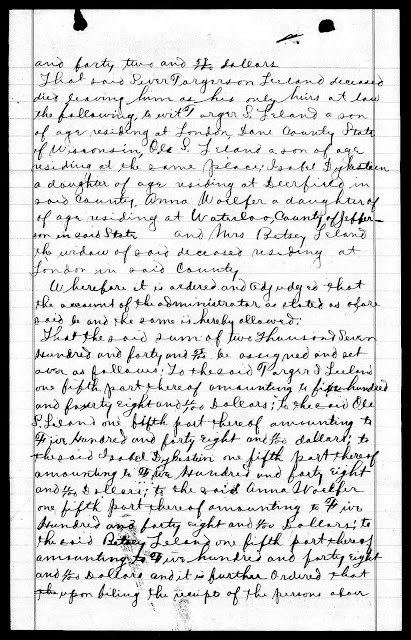 He brought his family from Voss in Norway to Deerfield in Dane County, Wisconsin in 1855.